Aphids are soft-bodied, sucking insects that are sometimes called plant lice. They feed on plant sap and subsequently excrete a sugary substance (called honeydew) that can attract ants as well as support the growth of a saprophytic fungus called sooty mold. There are several species of aphids (all of which belong to the insect family Aphididae) that are capable of attacking any type of vegetation. 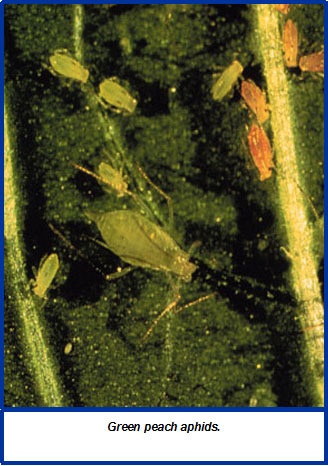 Host plants for some aphids can be identified by a particular aphid’s common name. The aphids that pose the most serious problem to Wisconsin vegetable production include the green peach, melon, potato and soybean aphids. Appearance: All aphids are soft-bodied and pear-shaped with a pair of cornicles (tailpipe-like structures) projecting from the rear end of their abdomen. Adult aphids may or may not be winged. Some of the more common species, along with their descriptions are listed in the table below. Symptoms and Effects: Reduced plant vigor, stunting, and deformation of plant parts are common symptoms of aphid infestations. In some cases, the presence of honeydew or sooty mold is the primary indication of an aphid outbreak. In addition, aphids are excellent vectors of several virus diseases such as a group of mosaic viruses that infect a wide host range. In some cases, the appearance of virus symptoms indicates that aphids are present. Life Cycle: Generalizing the life cycle of all aphids is difficult because of the diversity of their life habits ranging from single to multiple hosts. One of the unique characteristics of aphids that sets them apart from all other insects is their ability to bear live young. Aphids overwinter as eggs on a perennial host. In spring, the eggs hatch and the aphids migrate onto their summer host when available. These female aphids can reproduce without mating and hold eggs in their bodies to give birth to live young. By eliminating mating and egg-laying, aphids have shortened their life cycle and increased their reproductive capability. Throughout the summer, wingless females predominate, but winged forms may arise when populations become too large for the available food source. In late summer, in response to the shortened day length, wingless females and males are produced for the purpose of mating and laying of fertilized eggs that will survive adverse winter conditions. Scouting Suggestions: Look for “hot spots” of aphid activity scattered throughout the field. Because of the spotty nature of infestations, a number of plants in several areas should be examined for aphids. Examine the terminals of 15 consecutive plants (or other sample unit) and rate the plants as infested or uninfested. Given the huge reproductive potential of aphids, an infestation level of 5 to 10% would indicate a potentially damaging infestation. Repeat checks at weekly intervals to determine the need to treat. Cultural: Predators such as ladybird beetle adults and larvae, green lacewing larvae, syrphid fly larvae, and several parasitic wasps all help reduce aphid numbers when insecticides are not used. Heavy rains help dislodge aphids from the plant and, during periods of high humidity, fungal diseases may greatly reduce populations. The remarkable reproductive capacity of the aphid normally overcomes the effects of natural controls in spring when cool temperatures hinder the development of natural enemies. These natural controls are most effective in the warmer weather of summer and fall. Chemical: Treat with an insecticide when threshold levels have been reached. Refer to UWEX publication A3422 “Commercial Vegetable Production in Wisconsin” for a list of recommended products. Keep in mind however, that green peach and melon aphids have shown resistance to several insecticides. In particular, resistance to organophosphate insecticides has been reported. Bean aphid Aphis fabae Dark green to sooty black artichoke, asparagus, bean, carrot, corn, lettuce, parsnip, rhubarb, spinach, squash. Overwinters on Euonymous and Viburnum spp. Cabbage aphid Brevicoryne brassicae gray-green with a powdery, waxy covering broccoli, Brussels sprouts, cabbage, collards, kale, kohlrabi, and radish. Overwinters as eggs on host plants. Corn leaf aphid Rhopalosiphum maidis bluish-green corn. Does not overwinter in Wisconsin; migrates from the south. Melon aphid Aphis gossypii pale yellow to brown or nearly black with black cornicles asparagus, bean, beet, celery, cucurbits, okra, spinach. Overwinters on many plants. Pea aphid Acyrthosiphon pisum pale green with black legs peas. Potato aphid Macrosiphum euphorbiae pink or green asparagus, bean, corn, cucurbits, eggplant, lettuce, pepper, potato, sweet potato, tomato. Overwinters on rose. Soybean aphid Aphis glycines light yellow cucurbits, beans.